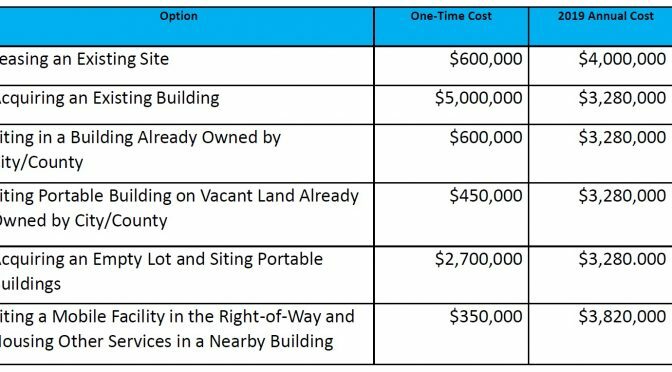 The city has published a feasibility study on establishing a “safe consumption” site in Seattle, and for the first time we have a sense for how much it might cost. This morning the Progressive Revenue Task Force held its second meeting, the first with substantive discussions of the issues. There were some important insights that help clarify the picture of the need — and the possible ways to address it. Last Friday I interviewed new Council member Kirsten Harris-Talley on a topic that is coming up with increasing frequency in City Hall: community-based organizations (aka CBOs), who they are, their role in our community, and their relationship with city government. Last week, the results of the annual One Night Count (renamed “Count Us In” this year) were released, giving us updated data on the extent and nature of the homeless crisis in King County and Seattle. The full report is 116 pages of tables. It’s heavy on data and light on interpretation. After spending several days poring over the report, here are my thoughts on what it means. Last month, three city departments quietly signed a Memorandum of Agreement re-establishing a formal monitoring role. Late last summer, Mayor Murray announced Bridging the Gap, his administration’s short-term plan too address homelessness while the longer-term plan Pathways Home, took its time to spin up. Both efforts have sputtered along since then, mired in city government bureaucracy and hidden behind a maddening lack of transparency and accountability. But there are now signs that the shorter-term effort is starting to find its groove thanks to a creative idea for how to reorganize the effort. Wednesday afternoon in the Human Services and Public Health Committee meeting, the City Council was asked by the Human Services Department (HSD) to lift restrictions on $125,000 set aside in this year’s city budget for a contract related to human service providers in the North Seattle area. They asked no questions, and quickly passed it out of committee for final approval on Monday. This represents their general approach to oversight of HSD, and it is a big mistake.